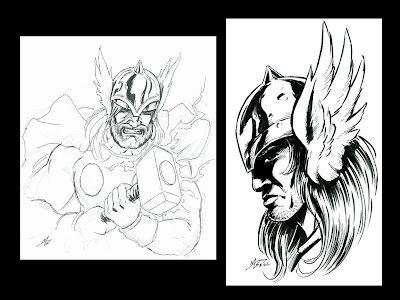 Well, I said I would post failures as well as successes...case in point: Thor. I thought I'd take a whack at a quick Thor piece, but was determined to keep it under 20 minutes. The first drawing was how far I'd gotten when I reached 20 minutes. :P So I stopped. Then I decided, "OK, that was taking too long--I'll do a quick little portrait!" So I did the one on the right. It only took about 15 minutes, BUT frankly, it looks like Conan wearing Thor's hat. Also, I got carried away with the shading.